For those who did not see my last post , we returned home from our visit to Washington State for two weeks only to find out my desktop computer is messed up. The auto update from Windows 10 did not work well. I have been using my mini iPad to comment and visit blogs for now. But, it is taking longer. So I will be visiting, it may just take me longer until I have my desktop back. Luckily this post was scheduled, I am sharing some more of my favorite sights from the Circle B Bar Reserve in Lakeland Florida. I hope you enjoy my photos. 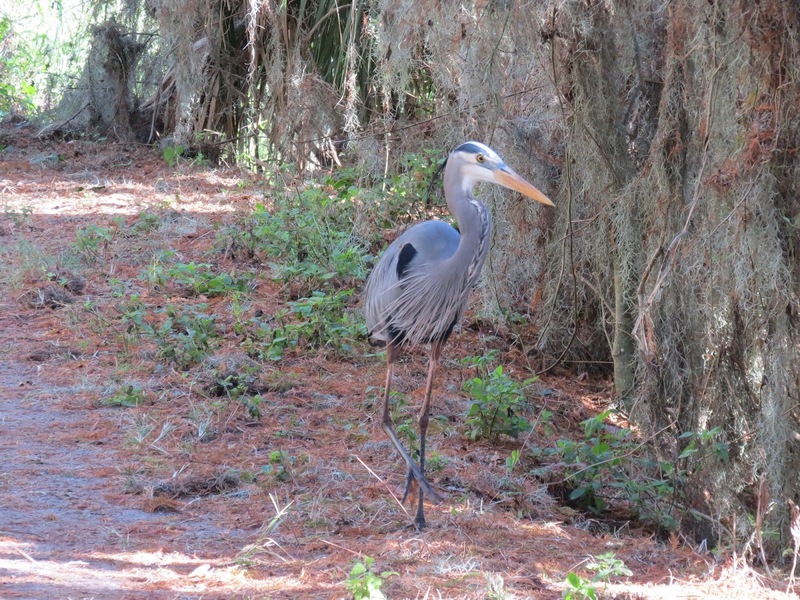 Come for a walk on the trails with me and this Great Blue Heron. The light is shining just right to catch the pretty colors on this Purple Gallinule. I believe this is a female Anhinga showing off her pretty feathers. The Great Blue Herons do like to pose for the cameras. The Green Heron does not mind striking a pose. A pretty female Hooded Merganser and her reflection. This female Painted Bunting was a little shy and tried hiding in the brush along the trail. Can you see her, she is bright green in color? This is the cool looking Turquoise Long-tailed Skipper seen on the Alligator Alley trail. Lake Hancock can be seen from walking the trail called Alligator Alley. 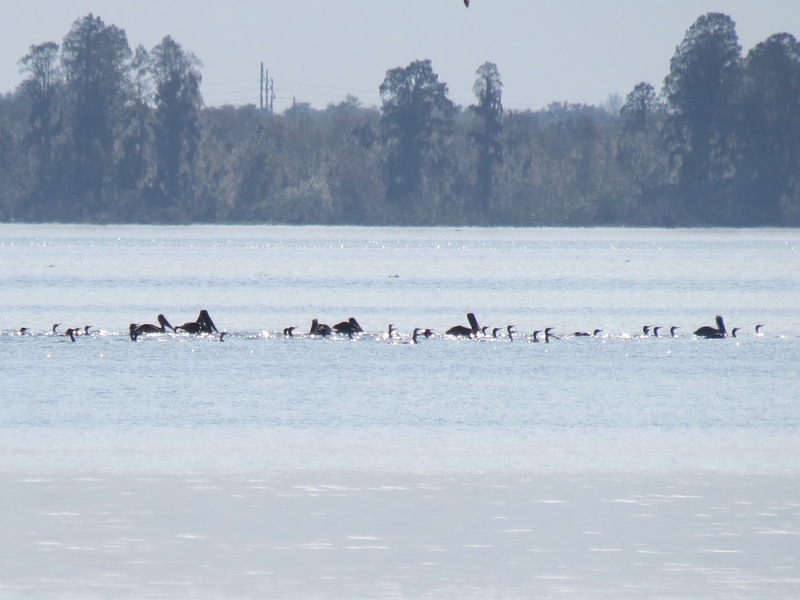 On this day we saw a group of Brown Pelicans with some Cormorants. Absolutely breathtaking photos in this series, Eileen. Beautiful series, Eileen! I have never seen an Anhinga, nor a hooded Merganser...except in photos! They are amazing! Thank you so much for sharing, and I hope you have a fantastic weekend! Wow - what amazing photos - so many wonderful birds. Of course the herons always catch my attention - but the pelicans and cormorants were spectacular - what a sight. Happy weekend. The reflection, that is one to print and frame, superb!!! As are all the others too, but for me, this is definitely #1 today. love your Hooded female image. A gorgeous shot! And love the skipper and everyone else. Sorry to hear about the W10 issue. My computer broke down last october beacuse of W10 update. I´m only back to something like "normal" today. But I will NEVER again save any images or anything else on my computer. I save it all on an external portable storage. I would too if I were you. That way I don´t loose anything when things go wrong. I hate W10 as they treat you like they own you. And there is no way to turn them off. There is one update they want to do that they actually ask me to do. So, every day I have to click "ask me next time"! Hope your issue is not to severe and will be solved shortly. Super shots. Love the Long Tailed Skipper. And I do like the very last picture. Morning Eileen, beautiful birds and next! Have a beautiful day! Sorry to hear about your compter issues. it can be a pain but these photographs are ALL wonerful Eileen. What a wonderful trip tht was and one I would love to take. Thanks for hosting and have a happy weekend. You've such a special link with every critter living in your so wonderful world, darling Eileen, your images always make me dream ! Pretty photos! The Herons is so beautiful. ...what a great collection, Eileen. Hello, Nice post and pics. Nice views of the wildlife! The hooded Mergansers were much more common than usual in south Florida this past spring. I was lucky to see one on our local wetlands. Good luck with yout computer. I find it next to impossible to work on my blog or even make comments on my iPhone. Oh My that skipper is amazing. Happy Day. Eileen, nice capture of the Turquoise Long-tailed Skipper. Thanks for sharing. Always am impressed by your photos, esp enjoy the birds! The female hooded merganser is wonderful, and I really had to look to see the bunting. Have a lovely weekend. What beautiful creatures Eileen. You always take such great shots! Happy Saturday to you and have a great week ahead. Love those bird photos, Eileen, and the blue heron is my fave. Wonderful Hooded Merganser reflection picture . . . Awesome shots, Eileen! Thanks for hosting and have a great weekend! Hello! Been away quite some time, and trying to now catch up on reading AND posting! (I linked up here) I have missed your posts, and will be going back and seeing all the wonderful birds you have shared! Hugs! Gorgeous Anhinga and Great Blue! Lovely shots of all. Wonderful captures, Eileen! Your painted bunting shot helped me with an ID on a bird I saw yesterday - I think it was a female or juvenile painted bunting! Thanks! Have a wonder-filled weekend! Hello Eileen. Bad luck with Windows 10. I've heard of other having similar problems. You Great Blue herons do like to pose. I've noticed that. 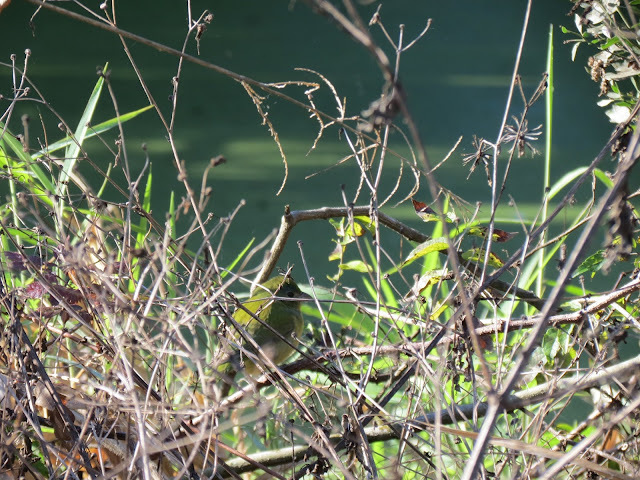 maybe the Green Herons too? Its good to see a female Hooded Merganser as I reckon most people, me included, would alwayus try and photograph the male. Thanks for the chance to join in today and Good Luck with that PC. We get herons up here from spring through fall, but others here we definitely do not see. Excellent shots! Amazing shots again! The critters' colors are so attractive. Thanks again for visiting my blog, for the comment and for sharing it. Happy Saturday too! So sorry about your computer. Hope it will be back to normal soon. Beautiful critters. I like the pretty female Hooded Merganser and her reflection. A great shot. Thank you for hosting and have a beautiful day, Eileen! Hi Eileen, These are the prettiest pictures. I love the reflection shot. Hope you enjoy your afternoon. I lived in Florida for 2 years & always loved to watch the herons & pelicans. But, seagulls are my favorite. Thanks for sharing! God bless you! Hello Eileen what a super selection of beautiful photos of the birds you captured on camera! I really admire the moth & it's gorgeous colouring. Lovely photos & thanks for hosting! Eileen, how do you get these shots? They are just magnificent! Fantastic array of water birds, they are the best. What lovely photos. I wish we had such beautiful wild birds around here. Hi Eileen. Another wonderful selection of images. Amazing collection of photos. Thank you for this moment of marvel. It is wonderful to see a post full of wonderful bird photos...I love all of these. Love the Hooded Merganser and her fancy "do". She's lovely. I hope you had a good trip! I'm so sorry you're having computer problems. I'm learning Windows 10 right now. The updates are a pain! Hugs! Great photos, especially of the herons. Hope you get your computer working again soon. So many beautiful birds.. the Purple Gallinule is so colorful and gorgeous..
Beautiful birds! The anhinga looks like a bit of a show-off. The hooded lady merganser and the purple gallinule are exceptional images Eileen. I do thank you so much for sharing this with us birders at I'd Rather B Birdin'...it's always a pleasure visiting!! Lovely photos Eileen! I do so enjoy herons, so majestic looking! Good morning Eileen, What a collection of beautiful critters, most of which I could never name! Thanks for sharing them. Enjoy your nature hikes and life! Great range of waterbirds in very productive habitat! the anhinga is stunning!! beautiful birds today, many thanks for hosting!!! Love to see all your critter pictures. Today my favorite is the reflection of the Hooded Merganser. Eileen, you always have the best photos of birds and this series is no exception. LOVE it! Lindo post e as fotos magnificas. Tenha uma semana abençoada. Wow...such beautiful birds and captured perfectly though the lens. Thank you for sharing your adventures with us! Love the picture of the Merganser..Cute skipper as well...Have a good week.. Marvelous photos of the different heron, Eileen. Thank you for hosting Saturday's Critters. Wonderful birds and memories! I'm scared to death about what might happen when I get that automatic update. Crud I wish they wouldn't do that to us. Hope you get yours fixed soon. Dear Eileen, Unfortunately my link went wrong so I entered it again, this time it was correct. I don´t know if you cant remove the first faulty one but please do if you can. Thank you very much for hosting the meme. I wish you a wonderful week! These are lovely photo's Eileen. Hope your computer problems are fixed soon!